Constant fan systems, especially those where an air handler serves an large open area, may be converted to variable volume systems. Figure 1 shows a typical constant volume system. The room thermostat/sensor controls the mechanical heating and cooling equipment to condition the space. The temperature in the duct therefore increases (heating) and decreases (cools) with constant flow. Comfort is achieved by keeping the volume of air servicing the room constant while varying the temperature delivered. 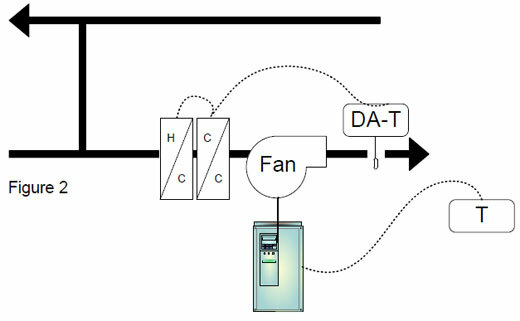 Figure 2 shows how the system may be retrofitted to a variable volume system - with an AC drive controlling the fan speed. The discharge air sensor (DA-T) controls the mechanical equipment to keep the temperature in the duct constant. The room sensor controls the ac drive. The principle of operation is very much like how a variable volume terminal box would operate. Temperature in the space is controlled by keeping the supply temperature the same and varying the volume of air delivered in to the space. Supply air can be kept constant or reset based on the outdoor or return air conditions. In the winter months, typical supply air set points are 60  65 deg F, while in the summer, 55 deg F is adequate. Minimum air flow requirements for the heating & cooling coils should be observed. Using DDC controls, the minimum fan speed set points maybe changed for heating mode and cooling mode.